Today is Themed Furniture Day, one of my favorite days of the month! 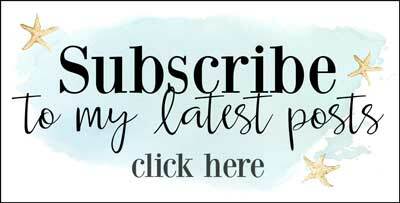 Our theme this month is Red, White and Blue, which is one of my favorite topics to be creative with. Growing up in the North, where old buildings and barns are everywhere, it’s easy to understand my love for vintage red, white and blue and all things Americana. 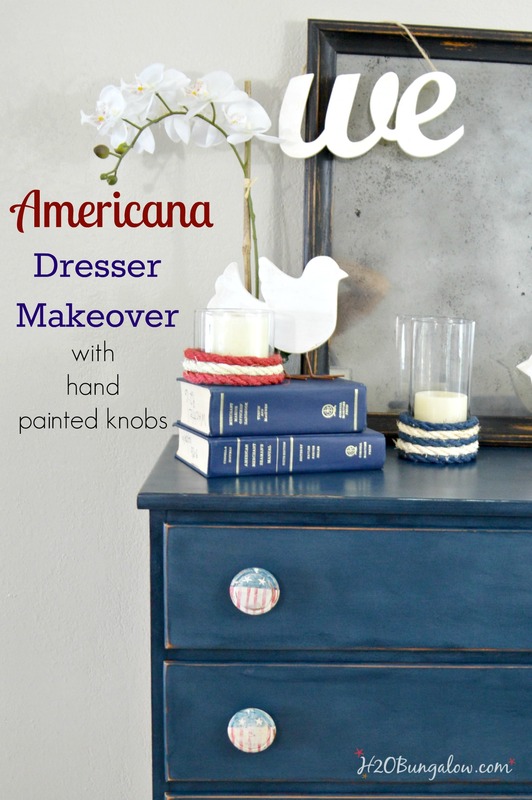 This little Americana Dresser makeover in red white and blue wasn’t planned. I just started painting and figured it would turn out the way it was meant to turn out. I love when I can let a project take its own form and just be whatever it wants to be when it’s finished. 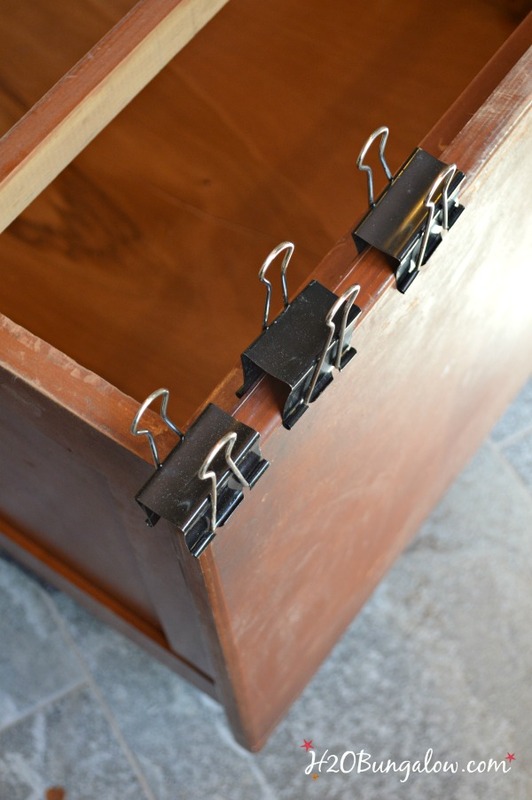 Metal office clamps and liquid nails are awesome and inexpensive for this type of job. The dresser, or chest of drawers got two coats of Born On The Fourth Of July, by American Paint Company with a 4″ foam roller. 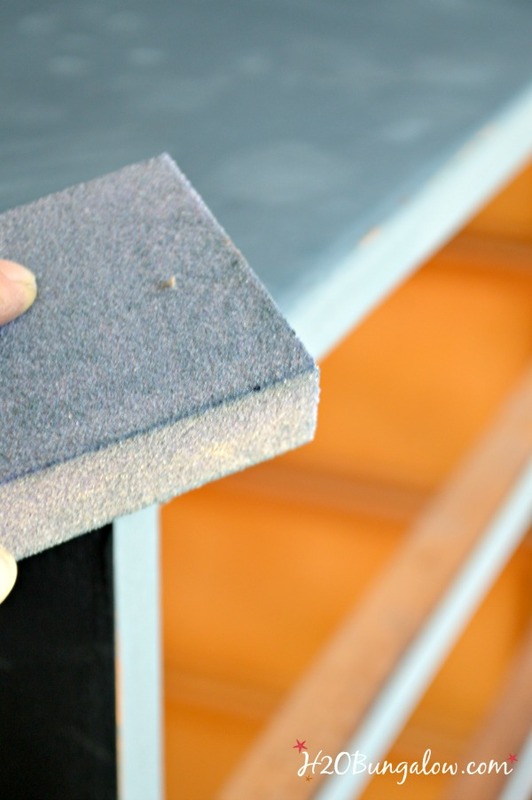 Followed by a light sanding with 320 grit paper and then a good distressing on many of the edges with 220 grit. I have lots of Annie Sloan Clear Wax left over from other projects, so I gave it two coats of clear wax. I’ve been using this wax brush in my classes and it works great for the money. Wasn’t sure where I’d work the red and white in with the blue. I had to since this was my themed entry, and Americana dresser makeovers are kind of supposed to have red white and blue in them, yes? I thought of painting inside the drawers, or on the drawer edges. But since this little dresser is going in my husband’s office/guest room, the Americana part had to be understated. Otherwise, I’m sure he would have said “thanks honey, you shouldn’t have” and started on about not having extra room in the office. Truth be told, I’m just trying to clear out the garage and the project pile. Anyone who needs a piece of furniture is fair game right now. The knobs were the perfect place of course! They started with a basecoat of Lamp White by Fushion Paints. This is a lovely aged grey-white color. I used a stencil brush and dry brushed some Country Barn, also by American Paint Company onto the knobs first. 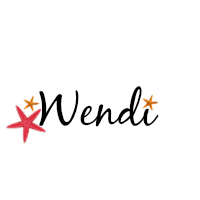 The stars are hand drawn and uneven, which is how I wanted them. I painted the blue by watering down the Born On The Fourth Of July that I used on the dresser body. It went on like watercolor, a fine tip brush made it easy to paint around the stars and details. A little distressing here and there, a coat of clear wax followed by some dark wax for character and the knobs turned out perfect! They were just enough of a wow on my Americana dresser makeover to make it stand out and not too much to be over the top. 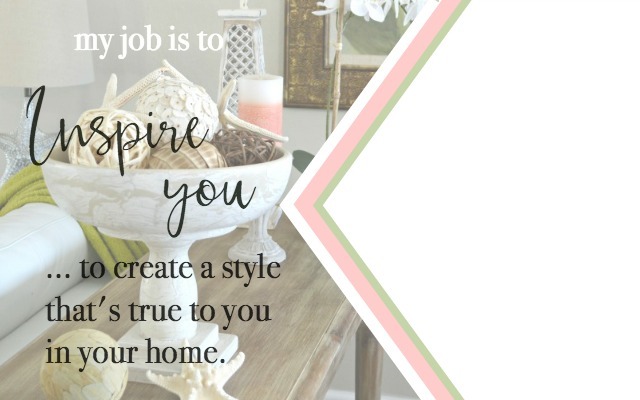 I staged it with a bunch of fun items I’d shopped my house for. Those red white and blue candle holders are an easy upcyle project. They fit just right. This may be one of my favorite patriotic makeovers. It’s hard to choose. 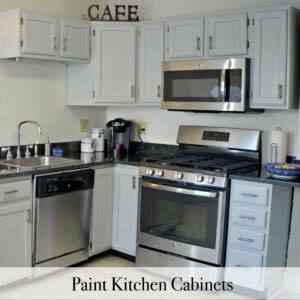 Here’s another one of my all time favorite red ,white and blue furniture makeovers. We use these Americana Decoupage Chairs when friends come over and of course on holidays. 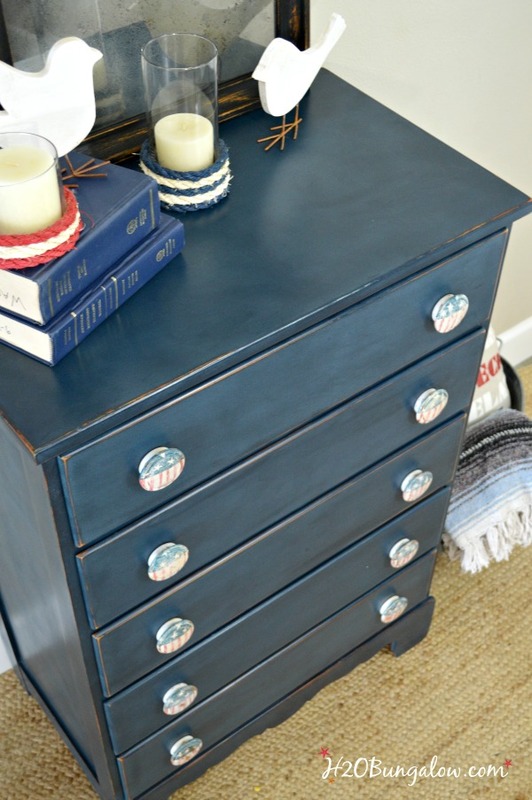 The Americana dresser makeover with hand painted red, white and blue knobs or my patriotic chair makeover with those fabulous decoupaged stars? 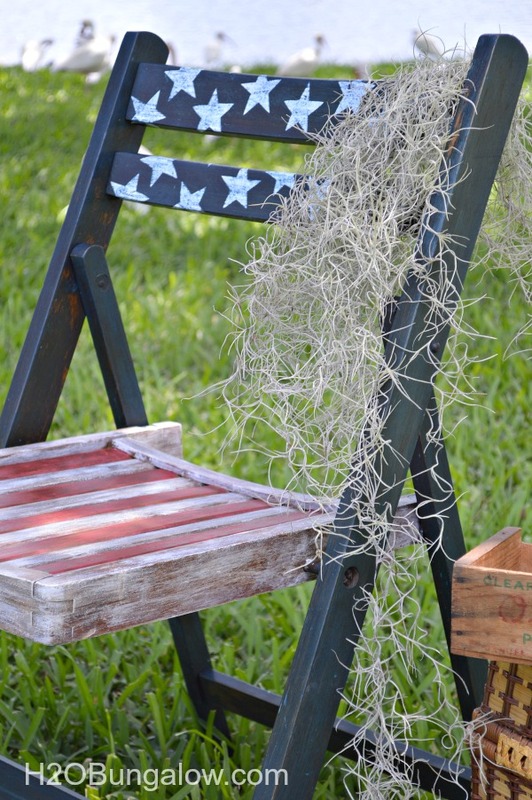 If you love red white and blue as much as I do, you’ll want to see what the rest of the DIY Furniture Girls came up with too. Click on any picture and you’ll go right to that project! I am obsessed with those pulls. My kind of project. I also think the visual of the green tape on white is striking. A whole different take to think about for another whole look. 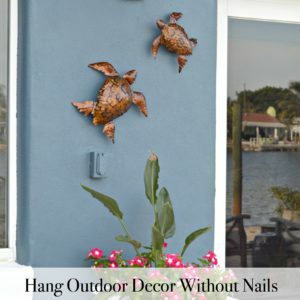 I might find a use yet for all of those wood pulls I have in my stash. I also really like the chair. Thanks for sharing. Hi Sewnya and thank you! Oh my gosh, I know what you mean on the pulls! I have a big box out in the garage. They multiply don’t they? Thanks so much for your visit and I’m glad my pulls inspired you:) I’d love to see how you put your own twist on the project! Great touch with the knobs Wendi! was so worth the effort, they really make the piece shine, love it! Loved and pinned. Beautifully subtle distressing of the dresser and oh_those_knobs! You know…you could sell knobs like these. They are state of art! Hi Stacy and thank you! I love these knobs and would make them again in a heartbeat:) It’s been a fun tour, I loved the theme! Thanks so much for your visit! I love the dresser! The knobs are such a cool finishing touch. Thanks so much Amalia! The knob are may favorite part. Thank you for your visit! Wendi, don’t you just love those extra little repair surprises? NOT! Those KNOBS! Love them, they really complete the entire look of the dresser. Great job! Hi Tami & thank you! I’m not a fan of those extra repair surprises either! It always happens when I’m pressed for time…wait, that’s always! LOL Thanks for your visit! Hi Shanna & thank you! You know how it goes, you get an idea in your head and run with it. If I’d stopped to think about cutting all those strips of tape, I may not have done it! Thanks so much for your visit! The knobs really make this piece a knockout! I know your husband is so pleased to have this in his office for extra storage. Hi Paula, He is! It was fun to watch his reaction when he came home and saw the whole project done. He really liked it. Thanks so much for your visit my friend! 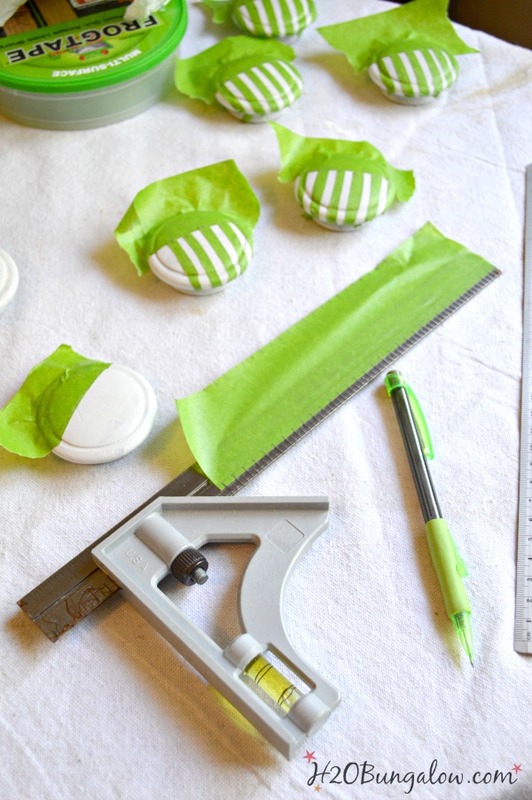 Those knobs are perfect–just right! Loving that blue… It all just came together didn’t it? I love when that happens. That sad little dresser is so happy now. Kim, I love when a project comes together in the end. I forgot to take the before photo, you described the dresser right, it was sad but had so much potential! Thanks so much for your visit and nice comment! 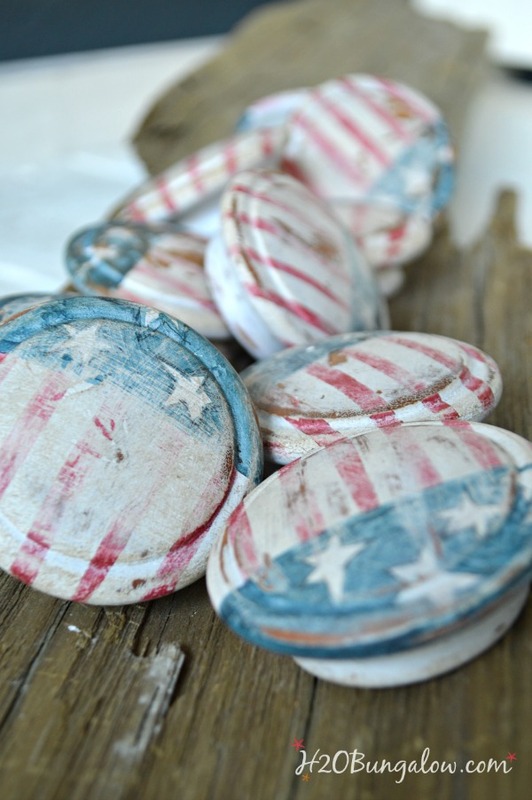 I am totally in LOVE with your Americana knobs!! Kudos to you for all those tiny details, but they make this piece for sure. What a wonderful addition this dresser would make to any space!! Hi Christy and thank you! I know you know how it goes when a “brilliant” idea takes hold. I didn’t think about how time intensive the knobs would be…all I saw was how I thought they’d look. Glad I followed the vision, plus it was fun:) Thanks so much for your visit! What a labor of LOVE with those knobs, Wendi! But they are perfection for this piece. I always thought that “born on the 4th of july” was the perfect NAVY color. Outstanding job as always! Just Beautiful. So enjoyed your makeover! 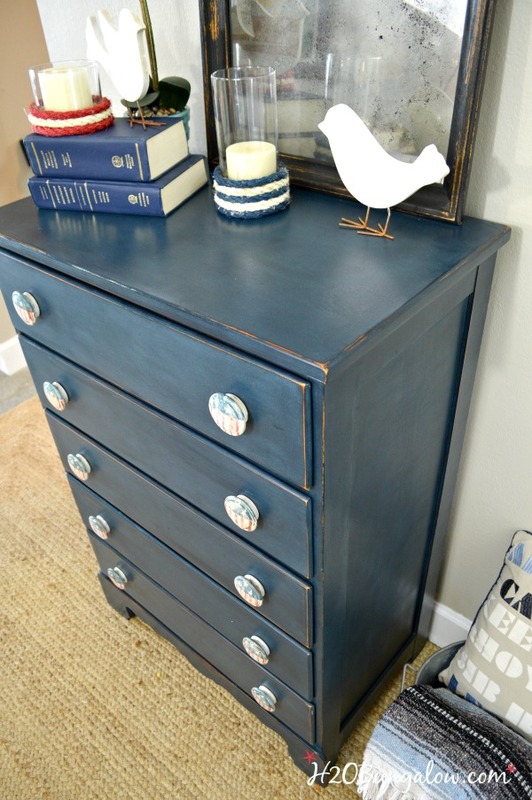 This is really a beautiful Americana dresser and your hand painted knobs are fabulous! Great job! Okay, those knobs would look gorgeous sitting in a bowl on a piece of furniture. They are works of art! Loving both of your Americana pieces! Hi Lucy and thank you! I can see you doing a project like this I know you love texture and interesting finishes:) Thanks so much for your visit! I am from the North also and I love our USA. The drawer pulls are the bomb and I want some. Thanks for sharing. 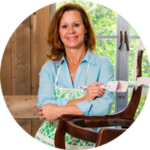 I am still looking for chairs to paint red, white and blue. Hi Jody, Thank you! I had a good time with this project, so glad you liked it too:) Good luck hunting for your chairs, I hope you find some soon! Oh my goodness! I love that little dresser. I can’t imagine it any other way now that I have seen it, the little dresser directed you perfectly, and those knobs are just the icing on the cake, just perfect. You are such an artist and I love your work. Hi Patty! Thank you:) I forgot to take a before picture of this little guy, but it was boring plain. The knobs made the look! Thanks so much for your visit & sweet words, they made my day! Oh My Goodness you are talented! & have the patience of Job to paint all those handles! What a brilliant idea! What a handsome makeover! Well done! I hope you have an amazing day! Hi Terry! Thank you so much, I think the patience factor was increased with the glass of wine:) You know how ideas take over a project, once I decided to paint those knobs, I was on a mission to make them awesome:) Thanks so much for your visit and have a fantatstic weekend yourself! Seriously girl, those hand painted knobs are gorgeous!!! I’m sure hubby was thrilled with his new office dresser, how couldn’t he. Hi girlfriend! Thank you. 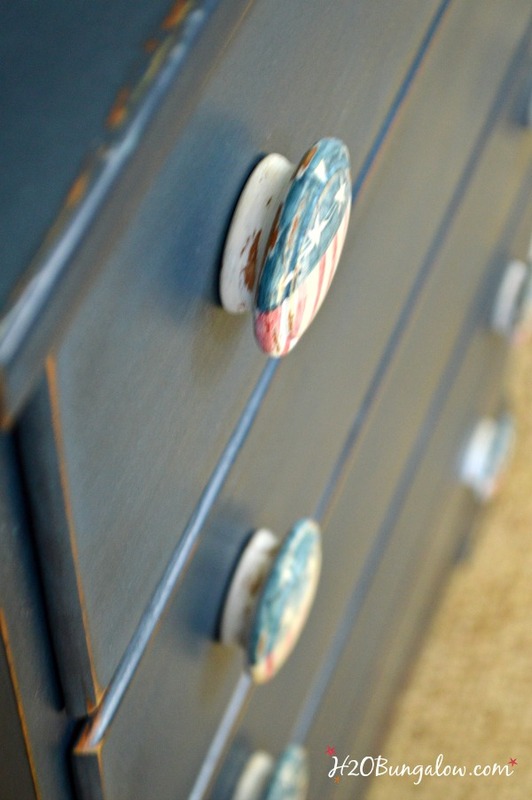 I had fun painting those knobs with a patriotic theme. Yes, he did like the dresser too. He needed something to store extra office supplies and I needed something for guests. It’s a win-win 🙂 Have a great weekend! It looks great Wendi – I adore the knobs! Pinning! Hi Jeanie…Thank you! The knobs were fun. I had a good time painting them. Thanks so much for your visit! Oh my goodness, those knobs are sooo darling! Totally worth the frog tape fun. I love that blue too, so pretty. Hi Amy and thank you. Yes, the frog tape fun was err…fun, and it was totally worth it:) Thanks so much for your visit! The knobs steal the show!!! THey are perfection for this makeover. Love the blue color you chose for this makeover!! Hi Lindsay and thank you! I love how they turned out. This color of blue is just gorgeous. It’s one of the prettiest blues I’ve seen yet. 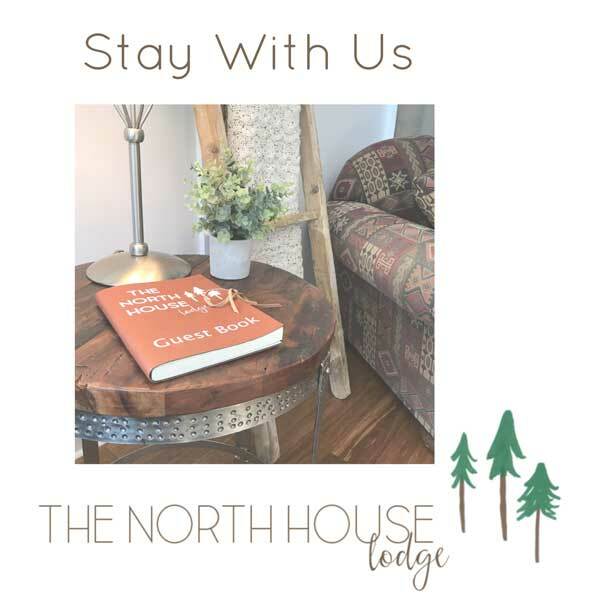 Thanks so much for your visit. Wendi the dresser is beautiful by itself but those knobs are “all the money” as we greeks say! And the fact that you had the patience to actually paint the design on like that shows why you are the master!! A gorgeous Americana piece indeed! Hi Mary…you are too kind! You know how these projects go, we get a “brilliant” idea and run with it without thinking in advance what it involves..LOL I’d have painted the knobs anyway just because the idea seemed cool. Thanks so much, and I love the phrase “all the money”! Those knobs!! You did an amazing love to this chest, Wendi. Americana is where it’s at! Hi & thanks so much Larissa! I love Americana anything. 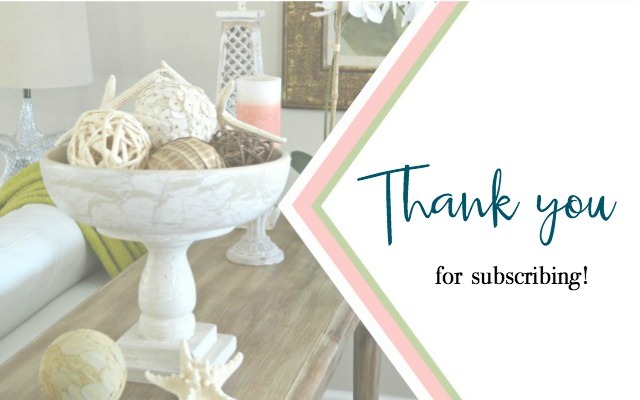 This months theme was a fun one:) Thanks so much for your visit!